A night at the sleep lab... I spent last night at the sleep lab, inside the main hospital in Logan. I didn't get a whole lot of sleep there, though. Once in the sleep lab, Sage (the sleep technician) showed me into my own little room, like a miniature hotel room – a bed, closet, and private bathroom. Then she started wiring me up. This happened in two stages, and involved lots of wires. 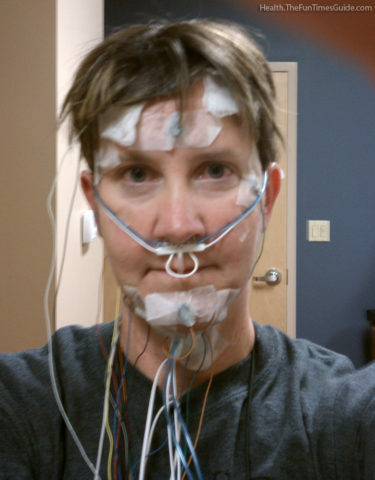 She put electrodes all over my head and face, so that they could monitor eye movement, eyelids opening and closing, teeth grinding, mouth position, and brain activity. Then there were electrodes on my chest for monitoring heart, and two straps around my chest to monitor breathing. She strapped a microphone to my Adam's apple to record snoring. Then she stuck an air flow and temperature sensor up my nose. Finally there were more electrodes on my legs to monitor their movement. In addition there was an infrared video camera filming my whole night, and a microphone recording any noise in the room. By the time she was done, at 10:30, I was quite a sight (about like the fellow at right)! All those wires led into a shoebox-sized junction box that contained a data concentrator; that was in turn connected to a data recorder that had a network interface. All this stuff allowed Sage to sit in her monitoring room and see a great deal of information about me, all in real time. All this was being recorded as well. For the first part of the night, until 1 am, Sage collected data on my sleep. I was able to go to sleep fairly quickly, and slept well until she had all the data she needed and woke me up for the second part. That second part involved fitting a CPAP machine to me, and experimenting with different pressures to find the setting that would work best for me. This is a special CPAP with the ability to have its pressure set remotely by Sage. For this to work, I had to be asleep – and with this machine strapped to my face, making noises and shoving air into me, that wasn't happening. I wasn't able to sleep more than 5 minutes for the rest of the night. Sage was able to collect a small amount of data, but she's pretty sure she did not get enough for the doctor to set a pressure. That means ... I'm almost certainly going to be told to go back for another night at the sleep lab. This next visit will be all night with the CPAP machine, most likely on some kind of sleep medication so they can be sure to get their data. Lovely. Can't say I'm looking forward to that! Also, after the not-so-pleasant experience last night with the CPAP machine I'm wondering whether the cure is worse than the problem. That will be a topic for discussion with my doctor! I got my CPAP several years ago, and it was the best thing that happened to me for quite a while. Much better sleep, even with the nose pillow aggravation. Hope it works out well for you eventually. They do have a lot of different styles of mask - keep trying.